During February, I set out to spend less while eating more healthily (post here), and after a month of planning, shopping, cooking and using up food in the house we saved almost 30%. After Christmas, our food bills were running at just over £60 a week for our family of four, but I was keen to cut them further. In the end, after scribbling shopping lists, looking up recipes, making meal plans, staring at cupboard contents, ekeing out ingredients and plenty of half term picnics, our food bills came down to just under £43 a week. 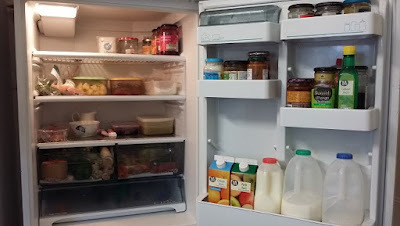 So cutting food bills during February worked well for us, and I’ve put my top 10 tips from the frugal food challenge at the end of this post. The key to cutting costs was trying to use as much as possible of the food we already had in our cupboards, fridge and freezer. I made a big effort to use up odd and abandoned ingredients shoved to the back of shelves and forgotten in the freezer. I had a go at using up stocks last July, but there was still some stuff left (post about the storecupboard stock check challenge here). Mantelpiece afterwards – finally, the spaghetti is finished! After checking the contents of our kitchen, and plugging it into my whizzy spreadsheet, here’s the summary of what we bought during February, and what we had left. So during the month of February we spent £177 to feed our family of four, which averages out at just under £43 a week. Compared to the £60 a week we spent during January, we have cut our food bills by nearly 30%. Of that, we’ve actually eaten just under £40 worth a week in addition to the food we already had in the house. I had hoped to cut costs further using supermarket vouchers, but fate intervened. Somehow Morrisons, the Co-op and Sainsbury’s all held back on any money-off vouchers during February. Then of course at the beginning of March I got sent a set of “£2 off a £20 spend” offers from both the Co-op and Sainsbury’s – just too late to be of any use for February’s food spending challenge. Pah. 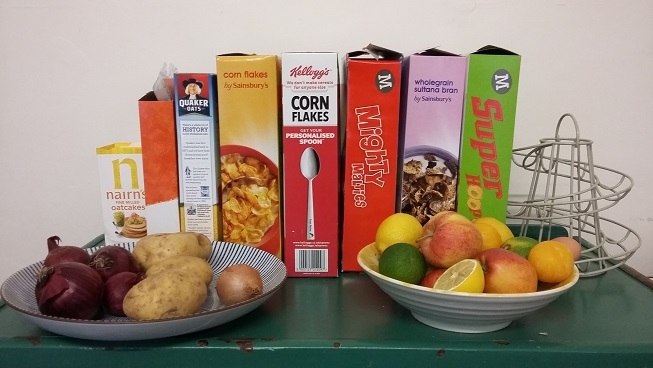 Making a concerted effort to shop and cook for less really did make a dent in our food spending, even though I kept on with pretty normal family meals with plenty of fruit and veg. However, it did take time. I think one of the main reasons are food costs are so low is because I do a lot of cooking, rather than relying on ready meals. When shopping, I kept an eye on the price per kilo, and focused on buying cheaper options. So with fruit and veg for example, I bought things like carrots, onions, apples and plums rather than more exotic offerings, and included some tinned fruit. That’s why I was particularly glad to find some yellow-stickered strawberries and avocadoes in the last week, as I’d been avoiding the expense earlier. We also cut costs by eating several vegetarian meals each week, and bulking out smaller quantities of fish and meat with plenty of veg. Some stuff was stuck at the back of the storecupboard because there wasn’t quite enough for a meal. I did things like cooking two different kinds of pasta in the same pan, to make enough for everyone, or serving each person different leftovers at a single meal. If we ran out of one ingredient, I tried to use something else instead, rather than simply replacing it – so I used granulated sugar when baking some favourite biscuits, rather than my standard soft brown sugar, and they tasted crunchy but fine. We ended up with some slightly odd combinations, in attempts to consume less favoured ingredients, and not all experiments were successful. Using up leftover mincemeat in flapjack was delicious, but my attempt at dahl with yellow split peas was not. Planning meals made a big difference to both costs and using up assorted abandoned ingredients. Surprise, surprise, if there’s stuff lingering too long in your kitchen, there’s usually a reason. Typically either we didn’t really like it, or I didn’t really know how to cook it, or we needed to buy something specific to make it edible. During February, I finally took the time to look up suitable recipes. Making a list of my top 10 abandoned ingredients (see the end of this post) worked well, and helped focus my efforts at the end of the month. In fact planning in general made our food bills less expensive. On occasions when I can see food will be expensive, I try to plan ahead. So for example we took picnics with us when heading out for half term, to eat in an assortment of cars, trains, buses and museum picnic rooms when weather was too cold. I know the kids will be ravenous after swimming lessons, so I pack some multi-pack crisps and drinks in the swimming bag, rather than resorting to the vending machines. When a whole horde of cousins descended for Saturday lunch half way through February, I wondered if was going to scupper my attempts to keep costs low. However, we have visitors on a regular basis, so I tend to stock up on suitable food when shopping. 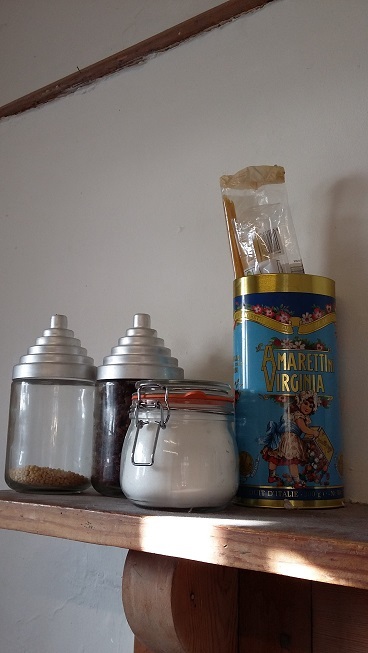 I planned a meal round ingredients we already had, including a bargain bit of roast beef stashed at the back of the freezer for just such occasions, and finished with bread & butter pudding made from the left over panettone on my hit list. We only made inroads into the unwanted ingredients once I switched to buying specific extras to make the most of the food in the house, rather than automatically restocking stuff that ran out. Sticking to a shopping list and buying limited amounts also meant we didn’t waste much, because it all got eaten. The other revelation that is hardly-earth shattering was that if I wanted to stop spending so much on food, I really did need to stop going to the shops. Even cut-price yellow-stickered bargains add up. Now I can open the cupboards, fridge and freezer without getting glimpses of food that makes me feel guilty, because we really should get round to doing something with it. Throwing away half-used packets and frozen remnants would have seemed a waste of money and resources, so I’m glad we were able to eat them instead. Also, we no longer risk life and limb when stuff falls out of overstocked cupboards! Now I have much more space to fill with food we actually like to eat. Recently I was able to bag a bargain leg of lamb, safe in the knowledge there was space in the freezer to keep it for a special occasion. No, really. Writing about my attempts to cut our food bills made me hesitate before putting extra items in my shopping trolley, especially later in the challenge. So I suppose you could say the blog itself helped save money! Although I did fork out for essential ingredients like flour, cereal and stock cubes when we ran out, I put off buying other staples like tomato puree, vinegar, sugar and soy sauce until after the end of the month. Our food bills in March will definitely be higher, but hopefully I can continue with some of our cost-saving measures. 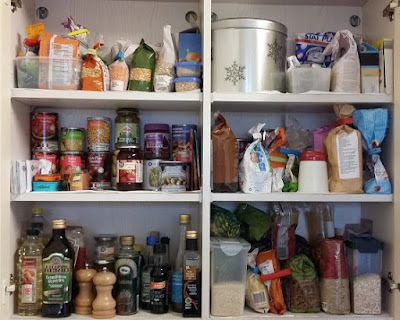 Anyone else have any top tips for a storecupboard challenge, using up the odd and abandoned ingredients stashed at the back of your kitchen? Anyone else willing to give it a whirl? I think your planning, shopping and cooking is incredible! My hat goes off to you, catering for four, plus friends of your children, on what you have spent deserves a medal. One thing I thought of, and it mightn't be feasible, but once the contents of both fridges are reduced, could you not transfer things from one fridge to the other for the rest of the month and switch one fridge off, thereby saving electricity, or isn't this practical and it mightn't save much money, but it's just a thought. Good point about the cost of running multiple fridges and freezers. The people before us left an extra fridge freezer behind, which I happily left plugged in until I was investigating electricity costs and realised how much extra power it consumed. It's now banished to an outhouse. 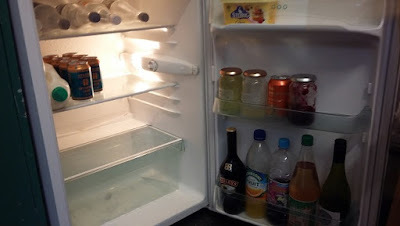 Our small fridge acts an overflow for extra veg, leftovers and drinks, and it's only really as empty as these photographs just before I go shopping again. Hadn't thought of switching it off some of the time. Will check! As long as you leave the door of it open if it's switched off, otherwise it will start to pong, har, har! 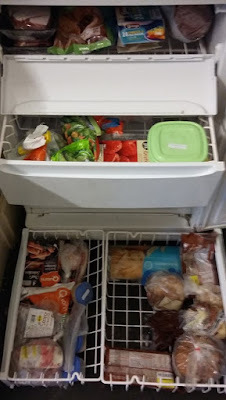 As your food supply dwindles in your freezer(s), you could stuff the empty space with newspapers (perhaps wrapped in polythene bags)as I believe that a freezer operates better if it is full. Even having some loaves of bread in it to gobble up the space might make it work more efficiently. I'm only repeating what I once read; if this isn't actually true, please don't shoot the messenger! Your spending is amazing. I have never seen it laid out like that. What a reduction on the waste well done. It really make you realise. 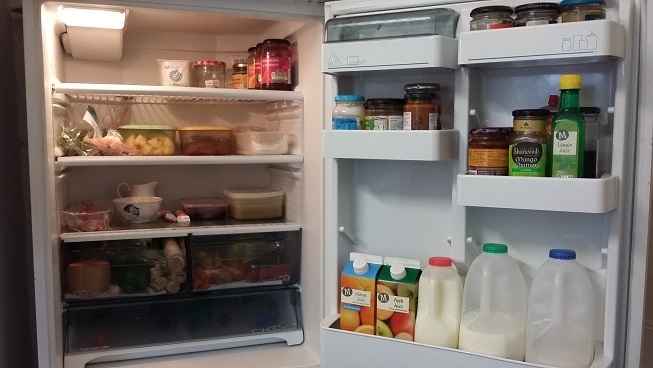 I wonder if you could get rid of your small fridge now and save on electric aswell! Thanks Carla! Must admit the small fridge does come in handy, especially when we have people to stay, so I won’t be pensioning it off quite yet.